There are many possible crossroads in life, some considered life changing events. The major event that changed our lives was the loss of a teenage son in a shooting incident on December 1, 1983. We began a quest for truth regarding the happenings surrounding that loss only to encounter lies and deception from the two boys who were hunting with Darrell that fateful day. The criminal investigation was minimal to begin with and was significantly stalled by clever actions of the lawyer who began to represent the suspected shooter on the day of the incident. Many months later my distraught and frustrated wife entered the office of Dr. Bruce Dunn, the Senior Pastor of a Bible believing, Bible teaching church. In tears and overwhelming emotion she related how empty we both were and how lost we seemed to be. That day changed our lives as a new spiritual awareness and a trusting relationship with Jesus as our Lord and Savior began to evolve. So, while seeking the truth of the incident that was froth with lies and deception we ran into another truth; the truth of the Bible. We now know and accept that God wants us to be active in making that truth available to others. However, I still ask why does it take a tragedy in one's life to recognize you are not on the right path in life? This book reveals strong evidence as to why one can trust God's written word as inerrant and authoritative. The Word of God opens paths of trust, not doubt. Assurance of your salvation lies within. And that is why the evidence should be shared with all your loved ones. God's word must be embraced as truth to be applicable to life - now and forever. Who should read this book: Anyone who has doubts about the truth and inerrancy of the Bible or who has siblings, children, grandchildren, neighbors, friends or business associates that have similar doubts should read this book. The book offers the facts that are within the Bible that should convince any reader that God wants everyone to accept his plan for salvation of sinners by His grace alone. 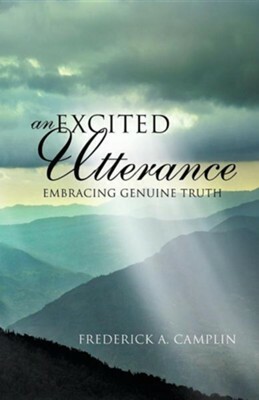 I'm the author/artist and I want to review An Excited Utterance - Embracing Genuine Truth.